As a company that has over 100 years trading experience, it recognised the need to replicate its established bricks-and-mortar presence online to capitalise on the growing number of online shoppers. Social media was considered key to maximising growth within this area and differentiating Miltons from other brands on the market. Leading eCommerce and online marketing agency Visualsoft was brought on board to create a digital marketing strategy that would drive brand awareness and traffic to Milton’s website, and ultimately increase conversions. 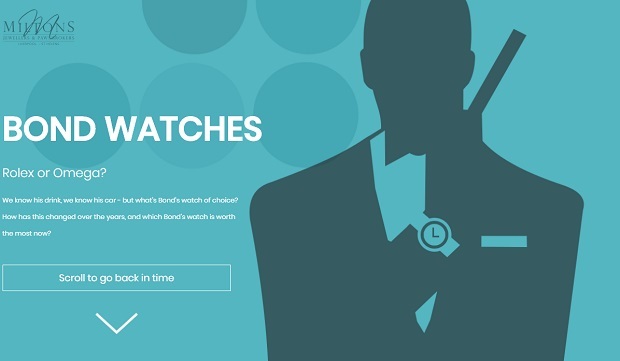 Capitalising on the power of the celebrity, Visualsoft created ‘The Bond Watch’ campaign. This linked the retailer’s products to similar watches worn by the iconic character James Bond. By creating and sharing content online and with the press around Bond and the watches consumers could buy that were considered ‘007-worthy’, the team was able to attract buyers’ attention, boost website traffic and sales. The online campaign not only bolstered revenue figures by nearly 90%, but also triggered 19,210 social views and a 79% increase in Miltons’ website sessions compared to the same time last year. Ben Johnson, web manager at Miltons Diamonds, said: “The Bond Watch campaign worked really well for us. We noticed a huge influx in visitors to the site and our engagement with customers also increased. “Working with Visualsoft really stressed the importance of ensuring our marketing strategy was up to scratch. Prioritising this aspect of the business proved to be the right move as it helped us reach out to an audience that otherwise might have remained untapped. Charlie Bailey, online marketing strategist at Visualsoft, said: “Retail is experiencing a challenging time, which is why even established brands like Miltons need to do everything they can to stand out from the crowd and appeal to shoppers. Visualsoft provides bespoke eCommerce solutions to over 1,000 retailers, including Charles Clinkard, Daniel Footwear and Canterbury, and is committed to helping businesses grow online. The company operates an innovative payment structure, Shared Success, in which clients are charged on a percentage of their increased online sales, rather than by an upfront or fixed fee.